A February ruling by Judge Tatyana Adamova of Moscow’s Savyolovsky District Court must go down as among the most absurd in Russian history. This is an outlandish and reckless claim that previously had never been alleged — except perhaps by a few crackpot bloggers on LiveJournal — much less proven. This year started quite symbolically in Russia. 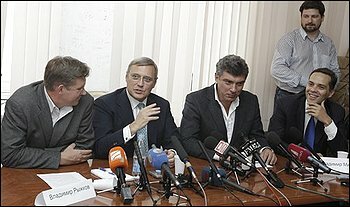 In the last days of 2010, government authorities decided to demonstrate their power and their intolerance for being challenged: The verdict issued at the farcical trial of Mikhail Khodorkovsky and Platon Lebedev had no relation to jurisprudence; leading opposition figures were detained for as many as 15 days on purely political grounds. These heavy-handed actions set a peculiar stage for President Dmitry Medvedev’s address at the World Economic Forum. Nevertheless, the intelligent and well-informed audience in Davos enthusiastically applauded his nice words about Russia’s economic modernization and dynamic democratic development. International business leaders seem to accept his complaints that few Russians understand his great plans for the country’s future, which greedy oligarchs and corrupt officials from the 1990s prevent him from undertaking. On Saturday, Russia will celebrate Russia Day. The roots of this holiday go back to June 12, 1990, the day the Congress of People’s Deputies of the Russian Republic adopted the Declaration on State Sovereignty for Russia. It proclaimed the “sovereignty” of the Russian Republic within a liberalized Soviet Union during Soviet leader Mikhail Gorbachev’s perestroika program. Among other things, the declaration, which was signed by the chairman of the Supreme Soviet of the Russian Republic, Boris Yeltsin, stated that the laws of the Russian Republic took precedence over the legislation of the Soviet Union. The idea of experiencing remorse over the collapse of the Soviet Union might seem crazy to those who still hold vivid memories of empty store shelves, food rationing coupons, medical clinics reserved for the elite, foreign currency stores called beryozki, rampant cronyism and special privileges for the bureaucratic elite to receive exclusive housing, jobs and education for their children. A note from the Translator: The authors have provided this third installment in their White Paper series to Novaya Gazeta and Grani.ru for publication. “Putin and the Crisis” will also be published in brochure form. The authors are Boris Nemtsov (First Vice Premier of the Government of the RF 1997-98) and Vladimir Milov (RF Deputy Minister of Energy in 2002). Both are members of the Bureau of Solidarity, the united democratic movement. This is the authors’ third White Paper. The first two –- “Putin: The Bottom Line” and “Putin and Gazprom” are well-known both in Russia and abroad and were translated into English by this blog. They have been censored by the Kremlin. Official propaganda would have it that this crisis is a “made in the USA” event and that the mistaken economic policies of the American government are the root cause of all our misfortunes in Russia. It is true that the origins of the crisis lie in America; however the crisis that has developed in Russia is far more serious and painful than in the West. We are facing a deep devaluation of the rouble – over 50%, the collapse of our stock markets where the indices have dropped 75% (40% in the USA), a budget deficit of 20% in December 2008 (not equalled even during the collapse of the USSR), a 36% drop in rail transport volumes in early 2009, a fall in ferrous & non-ferrous metals output, a rise of over 1 million unemployed, a sharp reduction in real salaries, rising poverty and the destruction of the middle classes. Why did the crisis virus hit Russia’s economy so hard?